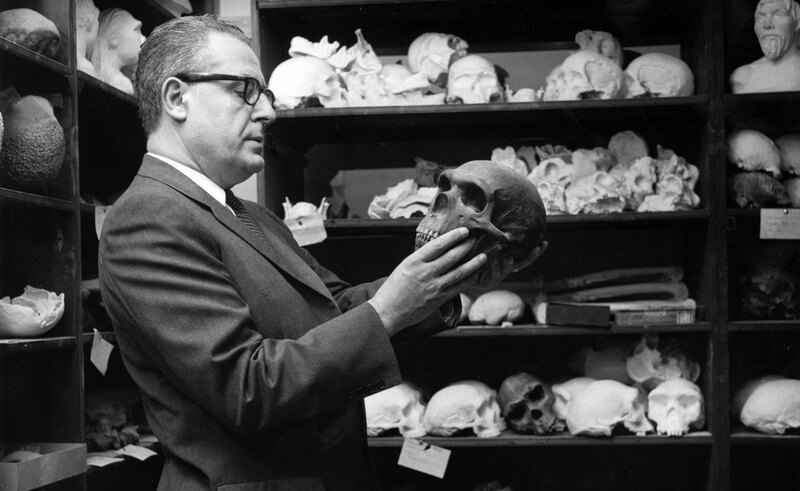 Loren Eiseley in his office at the University of Pennsylvania Museum, May 12, 1960. Photo by Bernie Cleff, courtesy of the University of Pennsylvania Archives and Records Center. 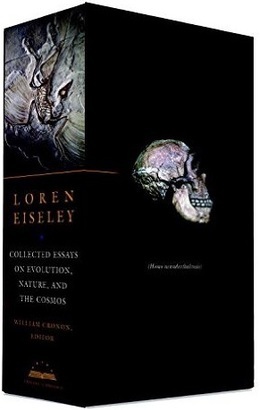 “My wife’s friends are constantly being startled by the skulls which glare down at them from the top of one of my book cases!” Loren Eiseley wrote in a letter to a friend. “We're short of room here in the apartment, and we’ve lived with dead men so long that we occasionally forget that outsiders must occasionally regard us with the horror and disgust which is reserved for New Guinea head hunters.” At the time the paleontologist was teaching at the University of Kansas; in late 1944 he moved to Oberlin College before finding a permanent home in 1947 at the University of Pennsylvania, where he had earned his PhD. That same year, he began publishing the series of articles in Harper’s Magazine that would make his writings known to a wider audience. Ray Bradbury came across one of the early Harper’s essays and sent off “a love letter” (as he later described it to an interviewer) praising “the single best essay I’ve read in an American magazine in twenty years.” The two soon-to-be-famous authors became correspondents and friends, and Bradbury accompanied Eiseley when the latter gave a speech at Occidental College in Los Angeles. The event was a flop. “He put everyone to sleep, because he was face down in his speech,” Bradbury recalled. “When it was over I ran up on the stage, I said, ‘Gimme that!’ I grabbed his speech and looked at it, and I said, ‘My God, Doctor, this is beautiful.” Bradbury—thirteen years younger than Eiseley—then lectured him on how he needed to work on his speaking skills: “I felt like a young punk, telling him what to do.” Oddly enough, Bradbury’s hubris seems to have reinforced their friendship, and Eiseley later wrote a letter thanking Bradbury and reporting that he had begun teaching himself to memorize his speeches. There are really two kinds of bone hunters—the big bone hunters and the little bone hunters. The little bone hunters may hunt big bones, but they’re little bone hunters just the same. They are the consistent losers in the most difficult game of chance that men can play: the search for human origins. . . . I am a little bone hunter. I’ve played this game for a twenty-year losing streak. Another essay, “People Leave Skulls with Me,” appeared in Harper’s in 1951 and revealed one of the odder aspects of Eiseley’s career as a bone hunter: how complete strangers occasionally offered old skulls to add to his collection. His various drafts indicate he had a hard time settling on a title; among those rejected are “The Heads in Haggerty’s Barn,” “Headhunting in the USA,” “The Head Takers,” “In a Place of Skulls,” “A Place in the Light,” and “Anthropologists?” When he revised the essay for inclusion in his 1971 collection, The Night Country, he changed the title again, to “Barbed Wire and Brown Skulls,” and it is that version we present as our Story of the Week selection. Notes: American cartoonist Charles Addams (page 183) was noted for his macabre characters, particularly those which became famous as the Addams Family. Cochise, Victorio, Nana, and Geronimo (page 186) were Apache leaders of the nineteenth century. Archaeologists, during the course of their lives, see and hear many strange things, but the fact that they are scientific men keeps them for the most part silent. . . . If you don't see the full selection below, click here (PDF) or click here (Google Docs) to read it—free!